The conflict in Syria is radicalizing an entire generation of young Muslims, killing or maiming hundreds of thousands of innocents, forcing millions of Syrians to flee their homes, destabilizing neighboring states, straining the bonds of European solidarity, and fostering religious intolerance in the United States and elsewhere. Almost any peace would be better than this war. 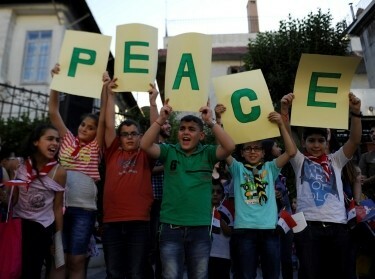 This essay presents a peace plan for Syria that is focused less on defining the nature of the Syrian state that might emerge from the conflict and more on the steps necessary to secure and sustain a ceasefire for the extended period that is likely to be needed for the Syrian parties to actually agree on new governing arrangements. 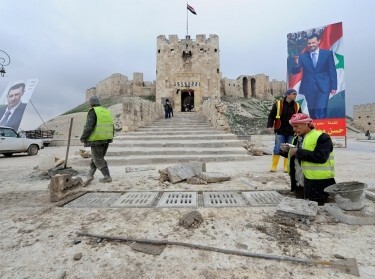 The proposal calls for deferring a comprehensive political solution and resolution of the Assad question and focusing instead on a ceasefire backed by international enforcement, regional devolution of power, humanitarian assistance, and a longer-term political process. The essay concludes that the external parties that have supported one side or another in the current conflict will need to come together to guarantee and enforce any such ceasefire, if it is to hold. 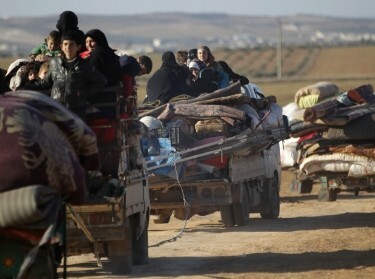 The parties will need to serve as external guarantors for three safe zones that reflect both Syria's battle lines and ethno-sectarian divisions. 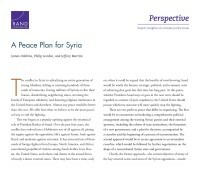 Dobbins, James, Jeffrey Martini, and Philip Gordon, A Peace Plan for Syria. Santa Monica, CA: RAND Corporation, 2015. https://www.rand.org/pubs/perspectives/PE182.html.